Ahhh, the sweet Holy Spirit of God! He guides us, teaches us, comforts and refreshes us like a sparkling river! It's important for all those who have repented of their sins and given their lives to Christ, to then obey fully and be immersed in water baptism in the name of the Father, the Son and the Holy Spirit and to also receive the baptism of the Holy Spirit. Without the Holy Spirit baptism we are trying to live the Christian life without the power God intended us to have, without the One who would teach us, comfort us and guide us. All you have to do once you belong to Him is believe what He says is true and ask. Receive by faith whether you display any outward signs immediately or not. Everything in our Christian walk is by faith. Keep believing and then you will see proof sooner or later! His word is truth - we can trust Him! In Christianity first we must believe it, then we see it. In the world it's the opposite, when I see it, then I'll believe it. We must do it God's way or no way at all. Let's not try to follow Him having only partially obeyed, but let's fully obey and walk in all the blessings He gave His life to give us!!! 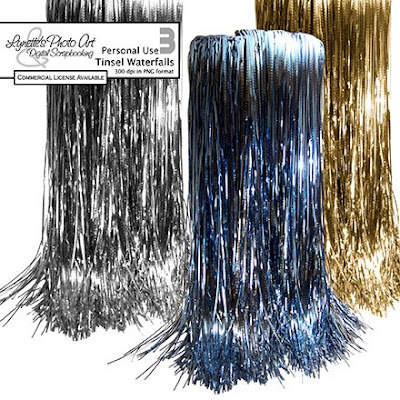 This is an example of one way you can use my Tinsel Waterfalls...in fantasy layouts. 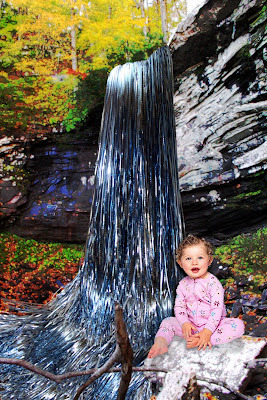 Here I altered two images I found on line and added my waterfall over the real one. I didn't spend much time on it and the baby's resolution is awful, but it's enough to give you ideas. I've given it to you in gold and silver too for your Christmas LOs. Enjoy! THANK YOU! This is so cool!! P.S. I thought you would find it ironic and interesting that the captcha letters spelled "evilis"... Wierd, huh? Thank you so much for this Freebie. I want to let you know that I posted a link to your blog in Creative Busy Hands Scrapbook Freebies Search List, under the Elements Only, Papers Only post on Mar. 07, 2009. Thanks again. I love the freebie and the idea to use it. Thank you for sharing with us your creativity !